To obtain access to the Canadian market, medical device manufacturers will need to secure a license. Health Canada issues two types of licenses: the Health Canada Medical Device Establishment License (MDEL) and the Health Canada Medical Device License (MDL). To see the difference between the two and find out more about the Health Canada approval process, please see or download the chart shown. 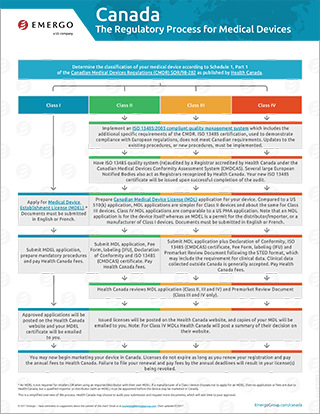 The chart shown illustrates the Health Canada approval process and is available for download in PDF format. However, if you would like to explain the steps to someone else in an email, you can cut and paste the text below or send them a link to this page. Determine the classification of your medical device according to Schedule 1, Part 1 of the Canadian Medical Devices Regulations (CMDR) SOR/98-282 as published by Health Canada. Devices fall into Class I, Class II, Class III or Class IV. For all devices except Class I, implement an ISO 13485:2003 quality management system which includes the additional specific requirements of the CMDR. ISO 13485 certification, used to demonstrate compliance with European regulations, does not meet Canadian requirements. Updates to the existing procedures, or new procedures, must be implemented. For all devices except Class I, have ISO 13485 quality system (re)audited by a Registrar accredited by Health Canada under the Canadian Medical Devices Conformity Assessment System (CMDCAS). Several large European Notified Bodies also act as Registrars recognized by Health Canada. Your new ISO 13485 certificate will be issued upon successful completion of the audit. For Class II, III, and IV devices, apply for a Canadian Medical Device License (MDL) application for your device. Compared to a US 510(k) application, MDL applications are simpler for Class II devices and about the same for Class III devices. Class IV MDL applications are comparable to a US PMA application. Note that an MDL application is for the device itself whereas an MDEL is a permit for the distributor/importer, or a manufacturer of Class I devices. Documents must be submitted in English or French. For Class I devices, submit MDEL application, prepare mandatory procedures and pay Health Canada fees. For Class II devices, Submit MDL application, Fee Form, labeling (IFU), Declaration of Conformity and ISO 13485 (CMDCAS) certificate. Pay Health Canada fees. Submit MDL application plus Declaration of Conformity, ISO 13485 (CMDCAS) certificate, Fee Form, labeling (IFU) and Premarket Review Document following the STED format, which may include the requirement for clinical data. Clinical data collected outside Canada is generally accepted. Pay Health Canada fees. Health Canada reviews MDL application (Class II, III and IV) and Premarket Review Document (Class III and IV only). For Class I devices, approved applications will be posted on the Health Canada website and your MDEL certificate will be emailed to you. For Class II, III, and IV devices, issued licenses will be posted on the Health Canada website, and copies of your MDL will be emailed to you. Note: For Class IV MDLs Health Canada will post a summary of their decision on their website. You may now begin marketing your device in Canada. Licenses do not expire as long as you renew your registration and pay the annual fees to Health Canada. Failure to file your renewal and pay fees by the annual deadlines will result in your license(s) being revoked. * An MDEL is not required for retailers OR when using an importer/distributor with their own MDEL. If a manufacturer of a Class I device chooses not to apply for an MDEL, then no application or fees are due to Health Canada, but a qualified importer or distributor (with an MDEL) must be appointed before the device may be marketed in Canada. This is a simplified overview of the process. Health Canada may choose to audit your submission and request more documents, which will add time to your approval.